"The Traveller's Tale" is the 96th Mandrake Sunday story. The story was written by Lee Falk and drawn by Martha Davis and Fred Fredericks. In Greenland a minor earthquake tumbeling ancient ice into the cold sea, inside an ancient man. Our friends are up at the Newfoundlands banks on Barton's new boat. While fishing they rescue a mysterious castaway, telling a strange story. Opolo was from the city Cromanga in tropical Yorkdon, now under tree miles of ice at the North Pole. He have been sleeping for 60 000 years. Col Barton, old friend of Mandrake. Argos II, the boat of Col. Barton. Opolo, 60 000 years old man. Natas, friend of Opolo and wizard of chemical arts. Second moon of Saturn, new home of Opolo and Adrana. The story title is from the strip of March 21, 1965 (Beginning: The Traveler's Tale). According to Peter van der Krogt there are 95 statues of Christopher Columbus in USA (in 2002). 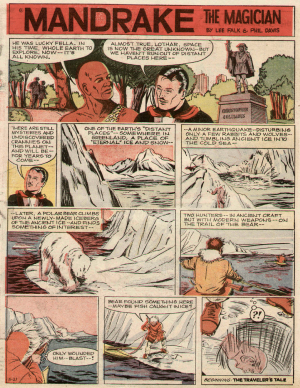 It is unknown which statue Martha Davis drew in the first panel of this story. Fred Fredericks new artist from the strip of June 27, 1965. "L'étranger venu de la mer", Le Journal de Mickey #1 (2001) note: one page only (first Sunday page).